The final story in our three-part series looking back on the era-defining trauma-rama of the Kopper Kettle explosion. Check out our giant gallery of unpublished photos here. Even the shirt made national news. Despite the lyrics, Chuck McDowell can’t “still smell the bacon and waffles” nor was he “barely six years old” the first time he ate there. He printed up the shirts. 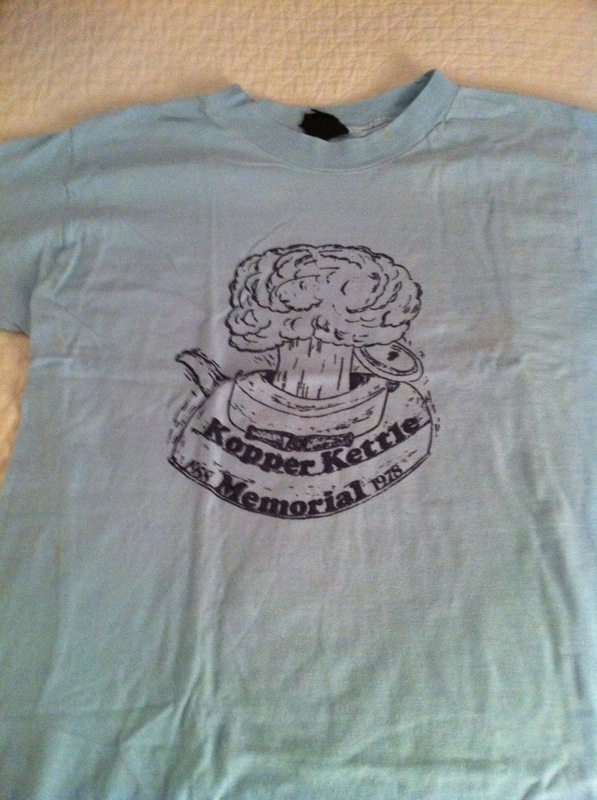 He wrote and recorded the local radio hit “The Kettle’s Gone.” But the man responsible for almost of all of the commemorative kitsch produced in the weeks following the January 1978 explosion that completely destroyed the Kopper Kettle restaurant in downtown Auburn never actually ate there. He didn’t even wake up when it happened. More than 70 businesses were damaged in the blast, which was caused by a natural gas leak and eventually determined to have packed the punch of 100 lbs of explosives. A block of East Magnolia Ave looked like a war zone. It was a big deal and received national media attention. Probably because it kind of was. After recording the song, McDowell borrowed money from his dad to press a batch of 45s and sold them on consignment at J&M Bookstore. let’s see some pictures of the Kopper before it burned. I was there, living in an old apartment house on the corner of East Glenn and Burton, when we heard the bang. We went back to sleep, only to begin freezing to death, because one of our doors had been blown open. I covered that for the old Auburn Bulletin. I worked there as part of my journalism requirement. One thing I remember is how fortunate it didn’t happen a little later when the intersection would have been filled with churchgoers. I and 3 other guys lived together on the corner of East Glenn and Burton, about 2 blocks NE of The Kettle. That morning, we heard the explosion and had no idea where it came from. Then the sirens, then we smelled gas in our apartment (apparently the explosion had either caused our gas heaters to go out, or maybe the city cut the gas off, we really don’t know). When we got up, we realized it was very, very cold in the front room. The explosion had blown our side door open. Memories of “fun” times at Auburn! @ Bud McLaughlin – I was at the Bulletin in the mid 80’s. Cathy Campell told me about this because I’d never lived anywhere with gas heat, and this freaked me out even more. CC said that Mr. Gentry (Andy Gentry, who owned the Bulletin when I was there with Paul Davis) missed certain death because his wife had him stay home with the kids that morning instead of going to his law office. I read your story from our archives! My daughter lives across from the library now, and every time I go down for a game, I want to walk over and pull out some of the old Bulletins…. good times. Was about 4 blocks away, I love the kettle.